Gov. 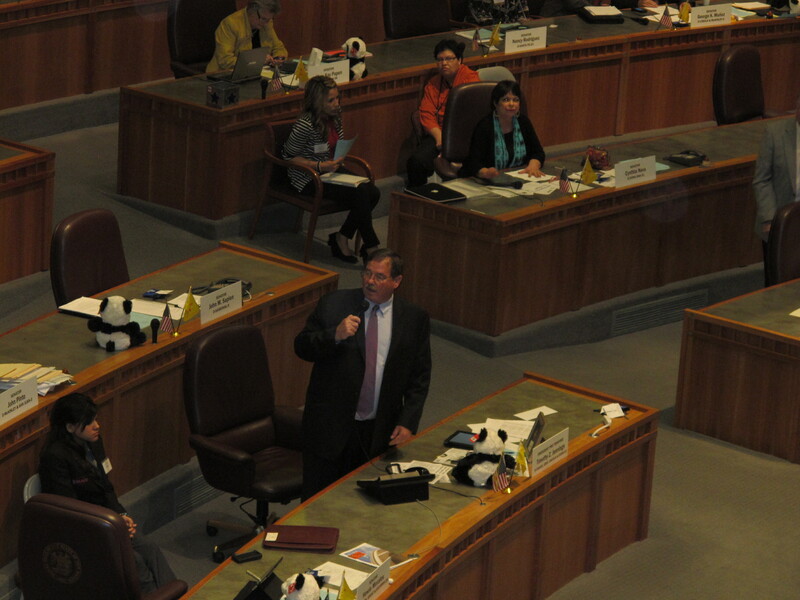 Susana Martinez used her annual State of the State address to announce her agenda for the 2012 regular session. The speech featured few, if any, surprises. Martinez called for teacher evaluations, which she said would help reward the best teachers in the state. Martinez called for teachers to assess children annually beginning in kindergarten and to tie teacher bonuses to the evaluations. The governor also supports a bill that would end “social promotion” or allowing students to move on from the 3rd grade unless they reach certain benchmarks. Most recently, state Sen. Kent Cravens (R-Albuquerque) resigned his position to take a high-paying job with the New Mexico Oil and Gas Association. Other well-known lobbyists are former state legislators. Governor Susana Martinez promised today to bring back the controversial and time-consuming issue of repealing a law that permits undocumented immigrants to receive New Mexico drivers licenses. Significantly, both the pro- and anti-repeal sides on this question claim that their respective positions better protect the public’s safety. Martinez, and proponents of the repeal, claim that immigrants from other countries come to the state for the purpose of getting drivers licenses, making this an issue of national security as well as public safety. Conversely, opponents of repeal say that letting undocumented immigrants, who live and work in New Mexico, earn drivers licenses makes the roads safer through accident and fatalities reduction, lower insurance rates, and simply providing law enforcement with a complete database of who is driving and what their driving record is. The Senate and House could not come to an agreement during the 2011 regular session on a bill and the session ended without one being sent to Governor Martinez’s desk. The Senate version would have allowed undocumented immigrants to earn drivers licenses, but would have clamped down on fraud. That bill would also have required foreign nationals to have their fingerprints taken in order to receive a drivers license. This fall’s special session saw Martinez once again bring the repeal up in the face of heavy opposition. The primary purpose of the special session was ostensibly the daunting once-in-a-decade task of redistricting. Nevertheless, Martinez put the drivers license issue, along with several other non-redistricting related items, on her call. Despite her action, the legislature did not take up the drivers license issue during the special session, although there was extensive media attention on the issue, both in the state and nationally. Now, once again, the issue will be back for a third time under Martinez. Martinez has rejected such a two-tier system. Sen. John Arthur Smith (D-Deming), who supports the Governor on repeal, nonetheless is concerned that the debate on such a controversial question would dominate the upcoming session— one limited to just 30 days with a focus on passing a state budget . “I’d hate for it to dominate. I personally think we have more pressing problems,” Smith told New Mexico Capitol Report’s Milan Simonich.